Once upon a time there was a young, hip grandma who planted the top off a store-bought pineapple and hoped for the best. For 6 1/2 years, this vibrant funny grandmother babied the pineapple plant. She watered it every third day. She set it in the sun and turned the pot so that all corners of the plant would thrive. When it dropped below 40F outside, she brought the pineapple plant indoors and lovingly wrapped it in a blanket. For six long years, she loved the pineapple plant. And then one day, just as all hope had been lost that the plant would ever produce an actual pineapple fruit, the plant finally bloomed. 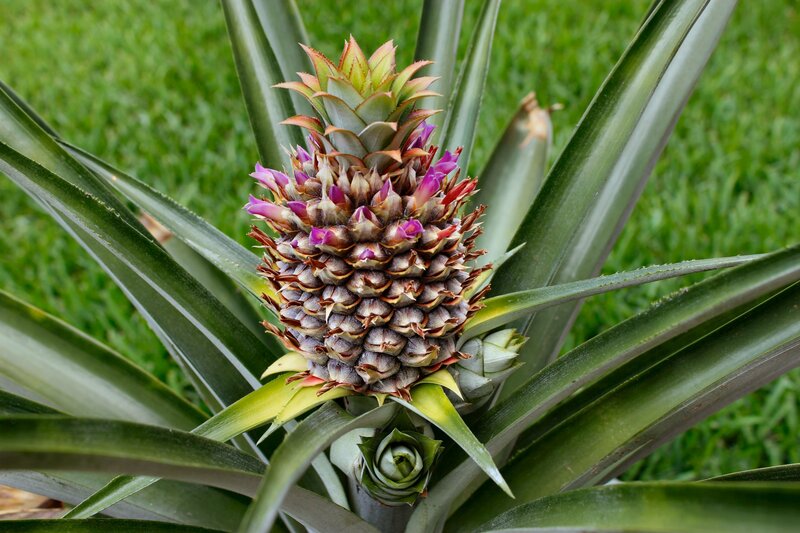 Now, you should know that the average pineapple plant takes approximately 2 to 3 years to bloom and fruit. But this one was a late bloomer; a very, very late bloomer. On that day, the incredibly patient, horitculturally gifted grandmother cried a little. Not because she was a borderline wackadoo as her beloved husband hinted, but because her hard work and dedication had finally paid off. Her dream of nurturing a home-grown pineapple to fruition had finally been realized. Love triumphed over despair yet again… and it was a beautiful thing. As the summer passed, the baby pineapple continued to grow as the caring yet brilliant grandmother was surprised and delighted daily. Together, they talked about the weather and sunlight and water and grandkids. Soon, the two of them became inseparable. The grandmother’s friends would see her and say, “Well, hello! And how is our baby pineapple doing?” And the grandmother would smile with pride and answer fondly, “She’s getting bigger and more beautiful every day” which was true, because the baby pineapple had begun to flower with lovely purple blooms the likes of which the scintillating grandmother had never seen. As time passed, the baby pineapple matured and grew into the adult pineapple the loving grandmother had always known she would become. Slowly, her purple blooms turned into the traditional pentagon shape patterns of an adult pineapple fruit. Yes, the baby pineapple had blossomed into a lovely young woman, and the illustrious grandmother was very proud. Her hopes and dreams were not only realized but exceeded as the pineapple plant began to produce offshoots that in turn, produced six additional new pineapple plants. At this, the vibrant and charming grandmother was pleased beyond her wildest dreams. But the wise, all-knowing grandmother understood that the future would eventually bring the inevitable. Some day, the pineapple fruit would mature to the point of harvest, and their more than six-year adventure together would end. This made the tender-hearted grandmother sad, but also hopeful. For the grandmother had a grandson, the gentle yet effervescent Jonah Bear, who – like the grandmother who planted the pineapple top and wished for the best – also had a dream. A dream of homemade pineapple upside-down cake. And so, with both sadness and excitement in their hearts, the family gathered this weekend to celebrate the second birthday of their beloved granddaughter Lilly Bug and the life and noble sacrifice of their beloved pineapple plant. Together they gave thanks for the blessings of nature as Jonah Bear (with help from the adults) at long last harvested the fruit from the pineapple plant. And the family’s sadness was transformed into a joyful celebration of life. A celebration of dreams come true, of a homemade pineapple upside-down cake, and of a little boy who couldn’t quite harness the excitement of it all. With the creative and yet humble grandmother at his side, the boy known affectionately as Jonah Bear began his adventure in baking a birthday cake for his baby sister. He sprinkled brown sugar and melted butter into the bottom of his prepared pan. He carefully placed the fresh pineapple rings and pieces. He meticulously and lovingly nestled the maraschino cherries into place. He waited until he thought the grandmother wasn’t looking and tried to snitch all the cherries back out of the pan without success because the patient but ever vigilant grandmother wasn’t born yesterday. Or the day before that. And when all was said and done, the boy’s pineapple upside-down cake dream at last became a reality. A beautifully fragrant, homemade reality. And a tiny princess got a birthday cake made with love by her personal hero. And this made the grandmother happy. Blissfully happy. The End. 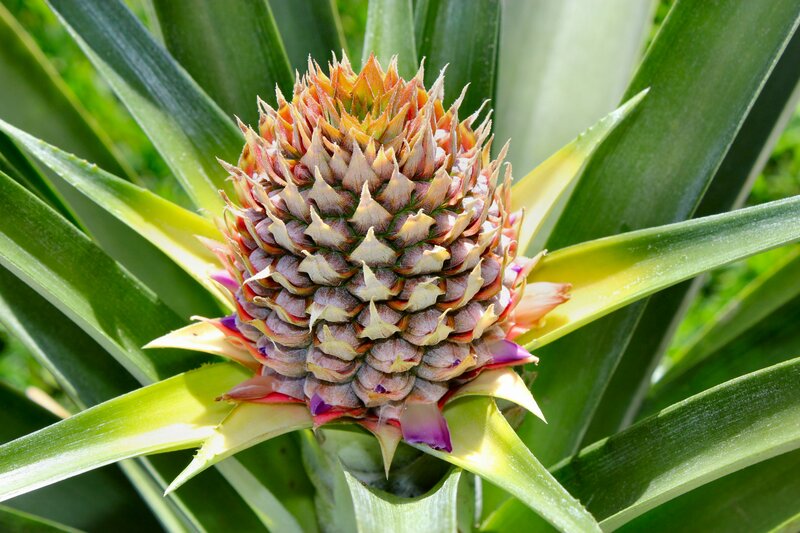 To see more about NanaBread’s pineapple plant adventures, simply type pineapple plant in the search box on the right hand side of this blog. It has been a long road from planting to harvest, but we enjoyed every minute of it. Thanks to everyone who came along on our pineapple adventure! 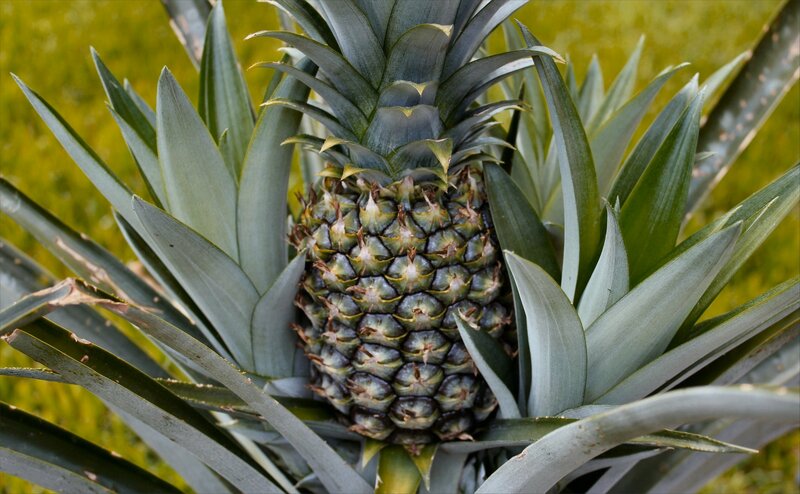 PS – the top of the pineapple has already been re-planted so it can grow and produce fruit of its own some day. I smell a sequel! What a wonderful story you do weave. I have followed the pineapple and now this beautiful cake is the end result. Triumph! And now the saga continues with another one to nurture. Thanks for sharing. Thank you, Doris. Although our pineapple plant took 6 years to fruit, she was a prolific breeder who produced 5 additional shoots which we replanted. In addition to her remaining 5 offspring, we also potted the top from the pineapple the kids gave me for Mother’s Day this year, and another we bought at the grocery store. We have no idea how long it will take these new plants to fruit, but with seven plants to carry on, I’m pretty sure we’ll get to do this all over again some day. Growing our first pineapple from start to finish was a real hoot. Hooray for Baby Pineapple! May she rest in peace knowing that with your tenacity and her will to thrive brought you family such joy in the form of a beautiful cake fit for a princess. I love the shot of Jonah-Bear with the loppers. His expression is priceless! Well done all the way around. Jonah Bear was ALL up in this pineapple harvest. He could not have been more excited. 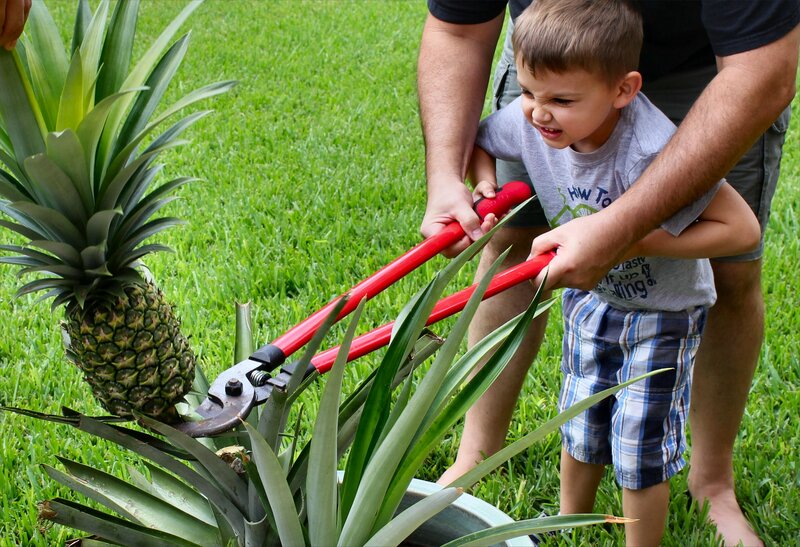 He got to harvest the pineapple, learn how to cut the top off and replant it, cut up the pineapple and core it, and turn it into a pineapple upside-down cake. Jonah loves to cook, and his cake was fabulous. Our baby pineapple could not have had a better or more rewarding ending. I’d been reading about your pineapple, but I missed the 6 years part until now. Wow! Yeah, they’re not supposed to take that long. Not sure why ours took her sweet time, but it was well worth it. I’m looking forward to seeing how long it takes the new plants to fruit. Fingers are crossed that they won’t take so long! YES. This was absolutely the most fun journey ever. And seeing Jonah Bear trying to get into the action was beyond adorable. Please keep us posted on future harvests – the cake looked delicious, but there is still so much fun yet-to-be-had! Thanks, Kat! It was a fun weekend. And the kids were a riot. 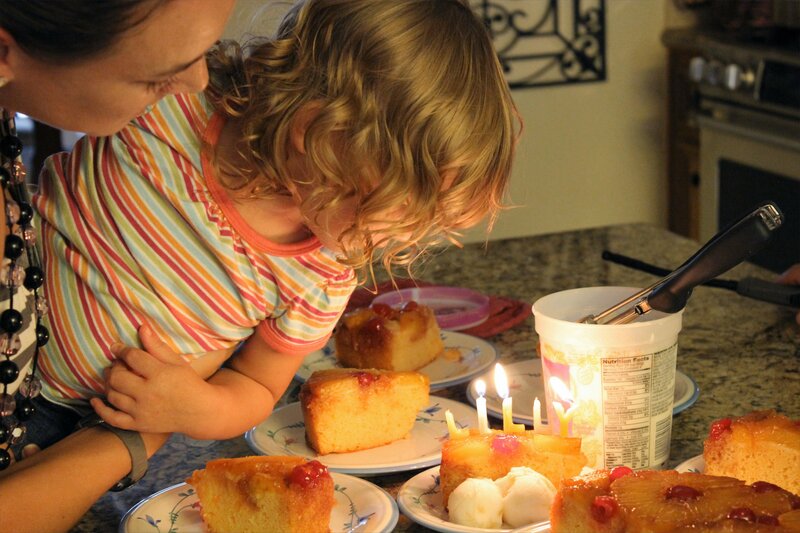 We’re still a little shell-shocked our Lilly Bug is now two (how did that happen?) and our pineapple is gone, but that cake was destiny. Jonah Bear called it the first time he saw the baby pineapple, and he was all kinds of right. We’re looking forward to seeing what all of our new baby pineapple plants bring and praying that they don’t sign up for the same 6-year plan. Next time around, I’d like a batch of overachievers! JonahBear and LillyBug had a great weekend – we did too! You’re story made me tear up – congrats! I’ve followed and seen the pineapple through all this and it still get’s me “right there”! We can wait to start our own pineapple plant, too!! 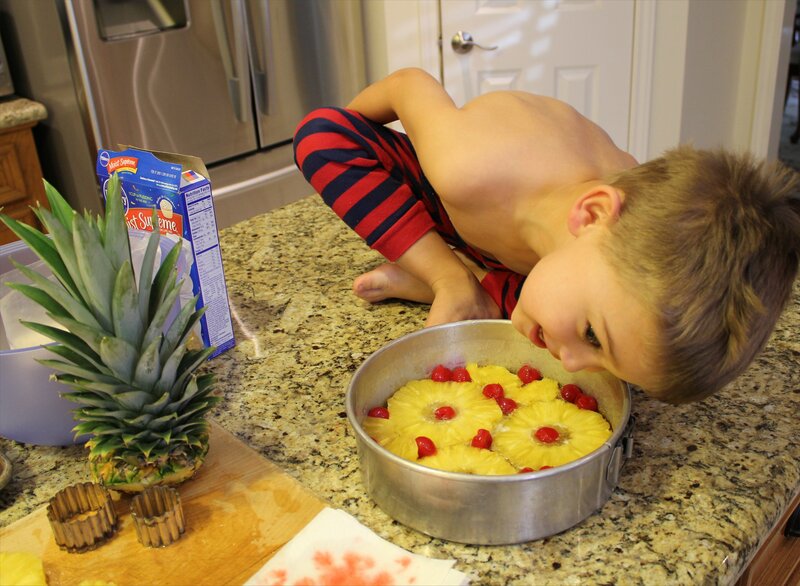 We had a great time seeing the little pineapple grow and we definitely enjoyed getting to eat the cake – YUM!! Thanks, honey. We would never have dreamed of harvesting her without you, Bama Boy & the kids. It was definitely a family affair. That cake was a perfect ending to a very memorable six year period in our lives – your wedding, both grandkids being born, celebrating them growing up together. It’s been quite a ride. The last piece of cake will be consumed tonight. I’ll be tipping my hat to the chef, the pineapple, and the entire family. Cheers! Thanks, Pat. 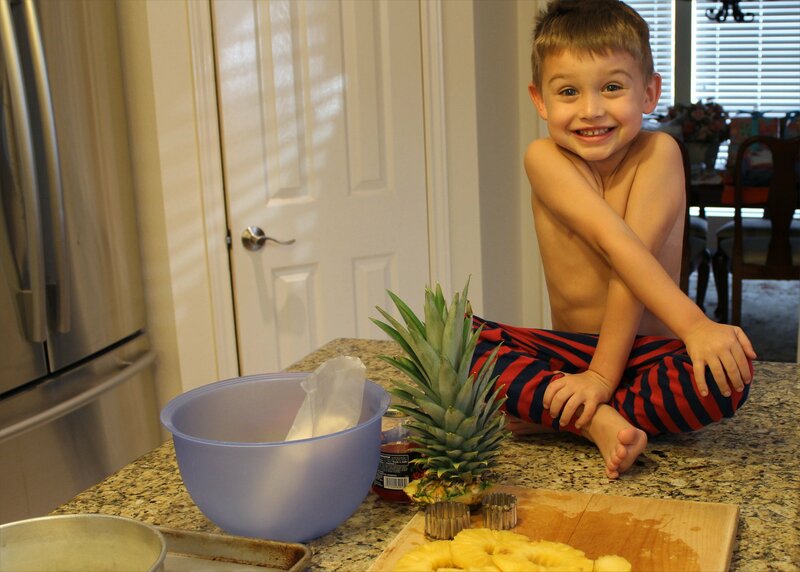 I don’t know how much Lilly will remember, but I know Jonah will always remember that first pineapple that we grew all by ourselves and the cake me made from it. Adios Pina! Happy Birthyday Lilly! I never knew a grandmother could be described with so many adjectives!! Glad it was a happy ending for everyone! hacked back to a stump, but it was worth it. That cake was fabulous! What a true bitter/sweet ending! I will miss Baby Pineapple stories but seeing the pic’s helps! It’s a little weird but I’m a little sad, heehee! But on the other hand, that cake looks AMAZING!!! I know how you feel, Deb. I still miss walking outside to see the pineapple every day. My back porch seems very lonely now. It was so educational and fun to see how a pineapple grows from start to finish, but I always knew this day would come. That’s the whole point in growing your own food, after all. 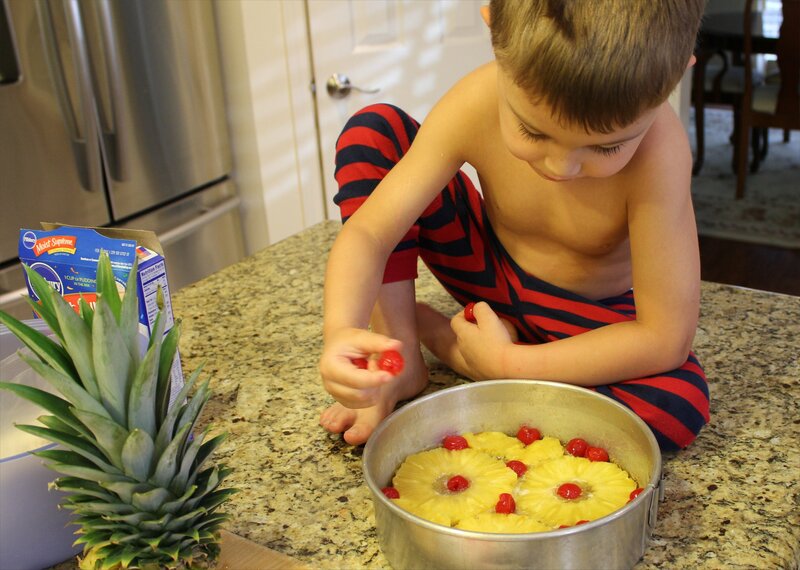 On the other hand, watching Jonah Bear cut that pineapple and get so excited about making his pineapple upside-down cake was every bit as fun as growing it. 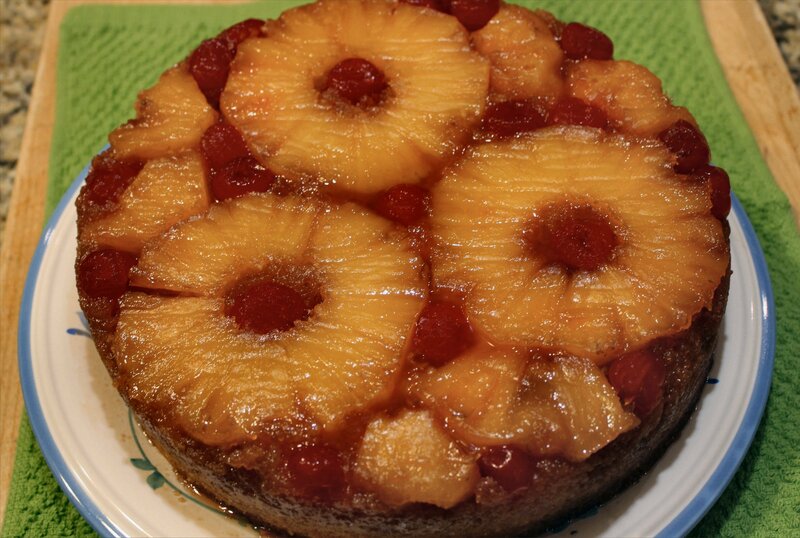 And for the record, that boy bakes a mean pineapple upside-down cake. It was crazy good! 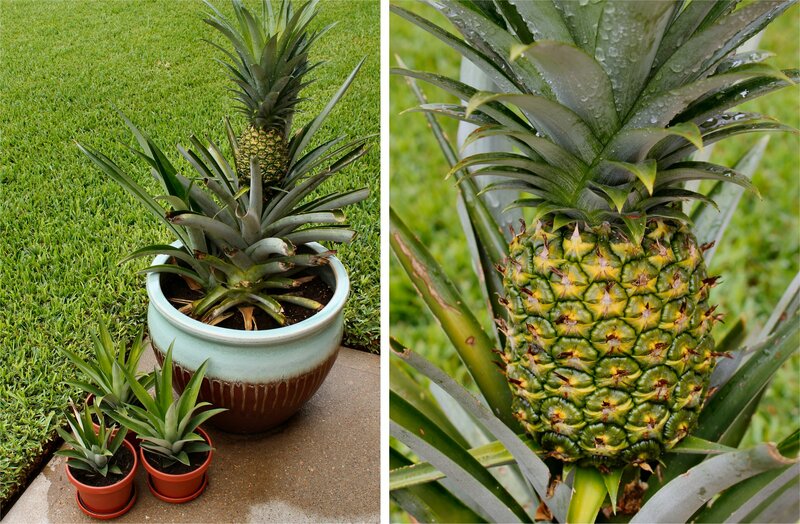 Loved the post and am inspired to grow my own pineapple. Does a freshly harvested home-grown pineapple taste better than one you buy from the store (like tomatoes or peaches)? Well, Michael… I’d like to say that a homegrown pineapple tastes much better than the store bought version, but I really can’t. If you buy a good, fresh pineapple in your grocer’s produce department that is perfectly ripe, it will taste just like the one you grow at home. The fun is really in the growing. To see your plant go from a lopped-off top to a full-grown pineapple is a hoot, especially given that I had no idea how it would bloom, grow, flower, sprout other plants and eventually mature. While the fresh pineapples are worlds better than the canned version, they’re basically all the same. What I can confirm for you is this – when the day comes that you finally get to cut it and eat it, you’ll feel like you’ve grown a little gem. And in truth, you have. I hope you’ll give it a try! I definitely want to give it a try. I had no idea they bloomed the way you described and really enjoyed the pictures. Having them taste better would have been a nice extra. Thanks for sharing! YAY!!!! How are the little pineapple babies coming along? This was honestly the best adventure in gardening I have witnessed on the blogosphere. And the cake? What an ending! Right now, all the pineapple sprouts and tops have been replanted and are growing just fine. They sort of resemble an agave plant or some type of cactus until they bloom. I’ll update soon with another photo of the six remaining plants we have. Cross your fingers that these don’t each take six years to fruit! Jeanne….what an awesome story! I can’t believe you planted that from the top of a store bought pineapple. Now you’ve got me wanting to try that! (I don’t think I’m that patient and nurturing!) Your grandbabies are just beautiful. As was that pineapple upside down cake! You should see our little pineapple farm on the back patio. We’ve planted 3 pineapple tops from store-bought pineapples over the past 6 years, and we now have 7 plants (and sent one home with the kids). I learned so much about pineapples from growing them, and I can’t wait to see how long it takes the remaining seven to bloom and fruit. Jonah Bear’s pineapple upside-down cake was world class. We had such a good time making it. Well, he made it – I just assisted. So glad that the fruit of your labor was enjoyed by all. 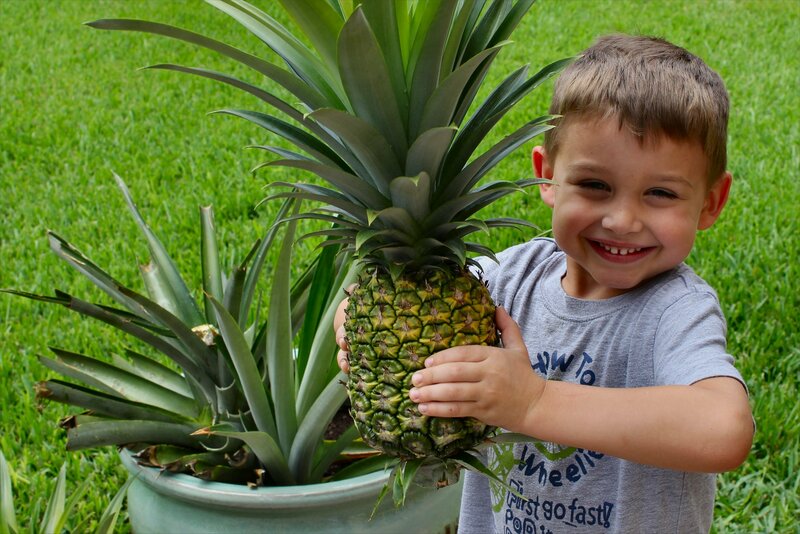 Maybe one day you will have enough home grown pineapple for your own luau! Hahahaha… I actually started to put humble in there! Glad you caught the sarcasm behind the adjectives. Somehow, I knew you would. And hey, if there’s booze involved, I’m always up for a good luau. If our seven remaining plants fruit and multiply like the first one did, we’ll have to invite everyone we know to that party. Wanna come? HI, I visited Hawaii in 2010 and brought back some pineapples to give away. I heard about growing a pineapple from the top of the pineapple and my pineapple plant “penelope” has been growing now for four years! She is a late bloomer too, I hope! It may be a coincidence, but our pineapples seem to bloom & grown more fruit now that we have multiple plants. Perhaps Penelope needs a mate. Fingers are crossed that she blooms soon. It’s too much fun to watch your own baby pineapple grow! You’re going to be a pineapple parent. It is so much fun to watch them grow. Send me a picture when you harvest! 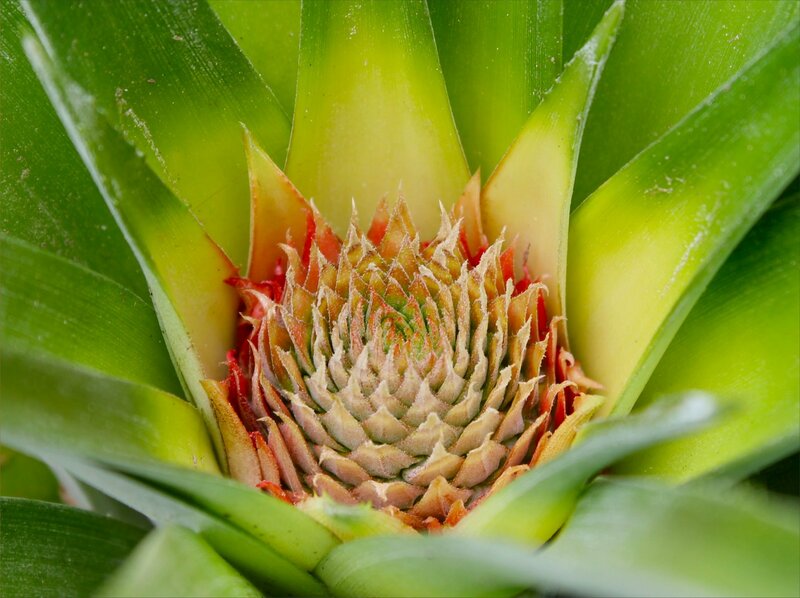 Rusty – August 8 ,2015 Speaking of late bloomers , our pineapple top has been growing for 9 years and now , finally a bloom ! We are soooo proud ! A baby pineapple , growing in Alaska .